In kinship terminology, a cousin is a relative with whom one shares a common ancestor. In modern usage, the term is rarely used when referring to a relative in one's own line of descent, or where there is a more specific term to describe the relationship: e.g., brother, sister, aunt, uncle. The term blood relative can be used synonymously, and underlines the existence of a genetic link. A system of degrees and removes is used to describe the relationship between the two cousins and the ancestor they have in common. The degree (first, second, third cousin, et cetera) indicates one less than the minimum number of generations between both cousins and the nearest common ancestor. For example, a person with whom one shares a grandparent (but not a parent) is a first cousin; someone with whom one shares a great-grandparent (but not a grandparent) is a second cousin; and someone with whom one shares a great-great-grandparent (but not a great-grandparent) is a third cousin; and so on. The remove (once removed, twice removed, etc.) indicates the number of generations, if any, separating the two cousins from each other. The child of one's first cousin is one's first cousin once removed because the one generation separation represents one remove. Oneself and the child are still considered first cousins, as one's grandparent (this child's great-grandparent), as the most recent common ancestor, represents one degree. Equally the child of one's great-aunt or uncle (one's parent's cousin) is one's first cousin once removed because their grandparent (one's own great-grandparent) is the most recent common ancestor. Non-genealogical usage often eliminates the degrees and removes, and refers to people with common ancestors merely as cousins or distant cousins. Alternatively, the terms 'second cousin' and 'first cousin once removed' are often incorrectly used interchangeably. The system can handle kinships going back any number of generations (subject to the genealogical information being available). Family tree showing the relationship of each person to the orange person. Cousins are colored green. The genetic degree of relationship are marked in red boxes by percentage (%). A cousin chart, or table of consanguinity, is helpful in identifying the degree of cousin relationship between two individuals using their most recent common ancestor as the reference point. Cousinship between two individuals can be specifically described in degrees and removes by determining how close, generationally, the common ancestor is to each individual. Additional modifying words are used to clarify the exact degree of relatedness between the two people. Ordinal numbers are used to specify the number of generations between individuals and a common ancestor, and further clarification of exact cousinship is made by specifying the difference in generational level between the two cousins, if any, by using degrees of remove. For example, "first cousins once removed" describes two individuals with the common ancestor being the grandparent of one cousin (one degree) and the great-grandparent of the other cousin (two "degrees"). The degree of lowest number is considered the degree. The cousins themselves are one generation different from each other (one remove). So, the difference between the degrees is the "removed" part of the equation. To make this easy to remember, think about it this way. Assign 1 to the word grand and 1 to each great. Figure two people with a common ancestor by assigning each of you the totals of the grand and greats. Example: If your great-great-great grandfather is another person's grandfather, your number is 4 (great + great + great + grand = 4) and the other person's number is 1 (grand = 1). Which number is smaller? 1. So, you are first cousins. The smallest of the two persons' numbers is the degree. Now, what is the difference between the two numbers? 4 - 1 = 3 So, you are 3 times removed. Example 2: If your great-great-great grandparent (great + great + great + grand = 4) is another person's great-great-great grandparent (great + great + great + grand = 4), then you are 4th cousins. There is no removed, because you are on the same generational level (4 - 4 = 0). 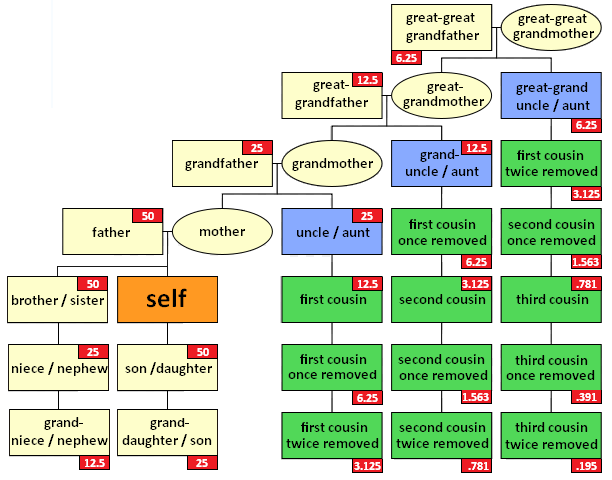 Example 3: If your great grandparent (great + grand = 2) is the second person's great-great-great-great-great grandparent (great + great + great + great + great + grand = 6), then you are second cousins, four times removed. Why? Because your number is the lowest, being 2 (so, the degree is second cousin), and the difference between your two numbers is 4 (6 - 2 = 4), which is the number of removes (generational difference).